In the days leading up to Black Friday, Guitar Center has announced a number of fantastic deals, but we figured we'd highlight this, one of the best of the whole lot. 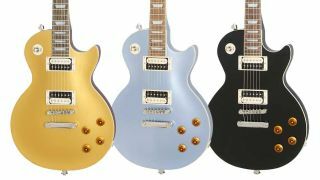 Guitar Center is offering $100 off select finishes of the Epiphone Les Paul Traditional Pro-III, bringing the price down to just $299. The finishes in question are Metallic Gold, Pelham Blue and Ebony; you can check out how they look above. If you want your Les Paul Traditional Pro-III in Wine Red and Pacific Blue, you'll be paying the regular $399. The Traditional Pro-III features a maple veneer-topped mahogany body, a mahogany neck with pau ferro fingerboard and Alnico Classic Pro humbuckers.